From my perspective, this was a fascinating site to visit as it is replete with remnants of the original railway workings that served the site. 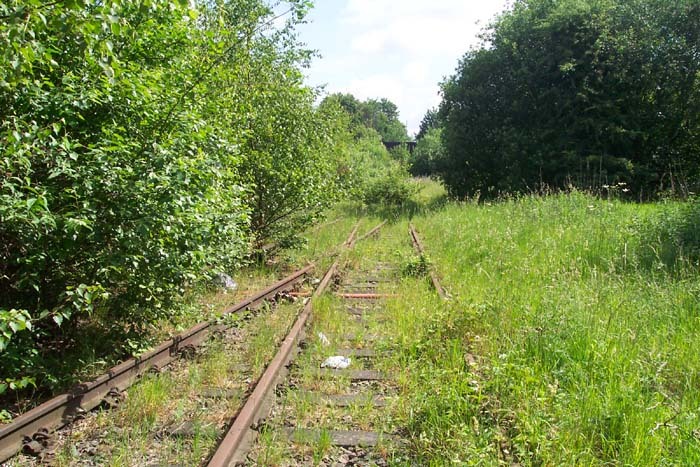 Built by the LNWR in 1850, Wednesbury Town stood on their line linking Dudley with Walsall and at one time the junction with the branch serving Darlaston loop. 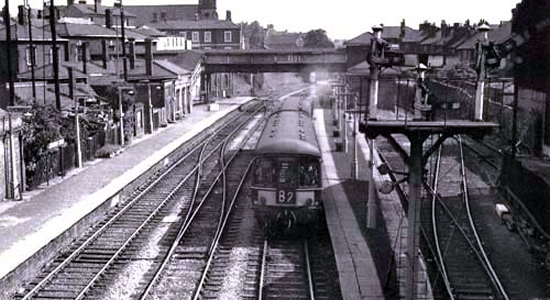 Above we see the station in 1963 from the Potters Lane footbridge (photo: M.J.Fox) looking towards Walsall: the line to Darlaston can just be made out branching-off to the left at the end of the Walsall platform. Unfortunately, the station originally known as Wednesbury ('Town' being added in 1950) was closed in 1964 leaving the town to be served by its GWR counterpart a few hundred yards away. 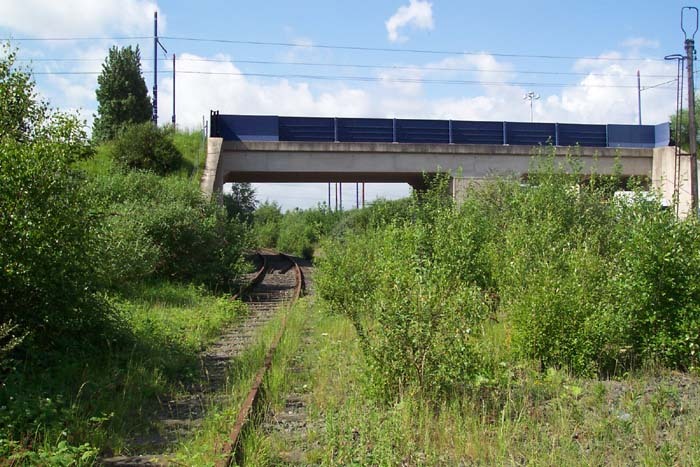 Above-left we are on Potters Lane level crossing with the station site to our left: the footbridge from which the photograph at the top of the page was taken was immediately to our left. Above-right we are looking away from the station, again from Potters Lane level crossing, towards Dudley into the grounds now occupied by the Midland Metro Wednesbury Depot - the Depot itself being ahead and to the right of this position. Above-left we are taking the same view as for the 1963 photograph of the station but, in the absence of the vantage point then taken, from the Potters Lane level crossing. 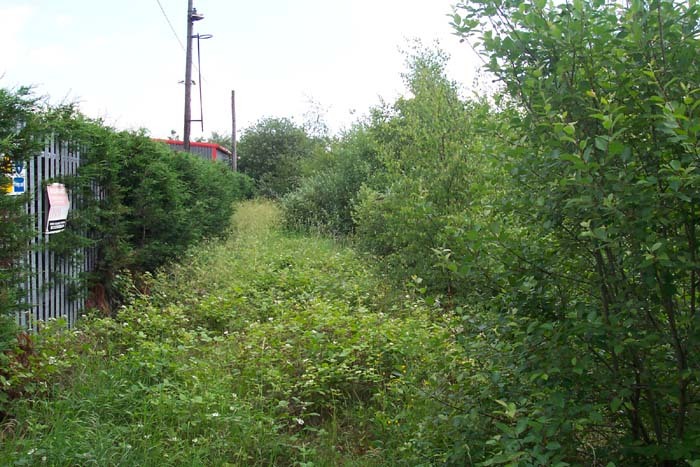 The area to the left of the track, where once the station buildings themselves stood and through which the Darlaston branch ran, is now occupied by a Biffa depot that can just be made-out to the extreme left of the shot. Above-right we have walked forwards into the station site and can see that the up and down main lines are still in situ. Above-left we are standing on the Walsall platform looking in the direction of Walsall with Potters Lane to our rear and the Biffa depot to the left. 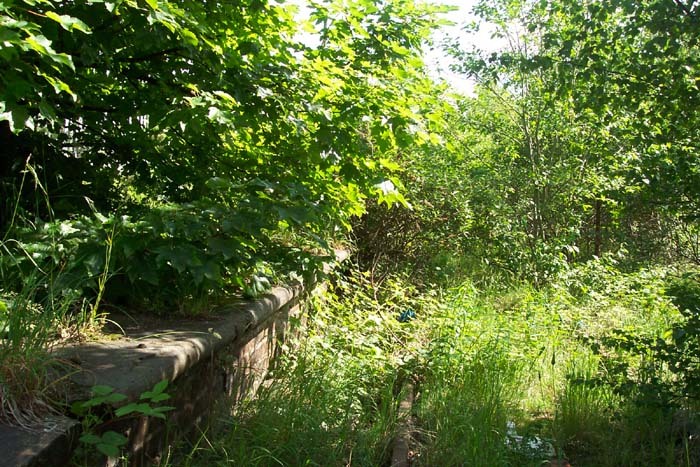 Although heavily overgrown, the fabric of the platform appears to be in excellent condition. 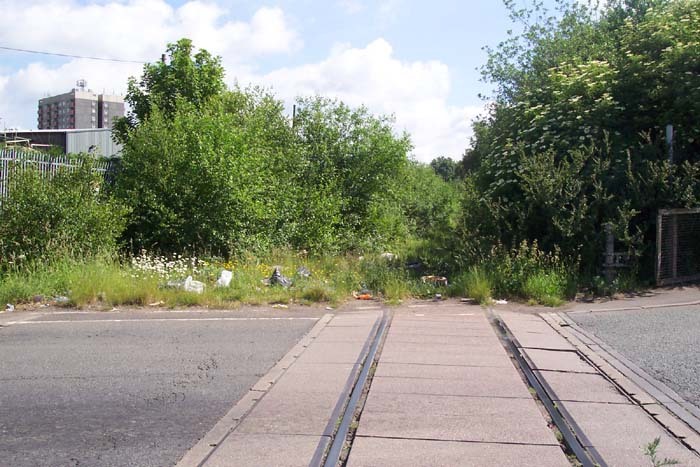 Above-right shows the beginning of the Walsall platform, hidden among the undergrowth, at the Potters Lane end of the site. 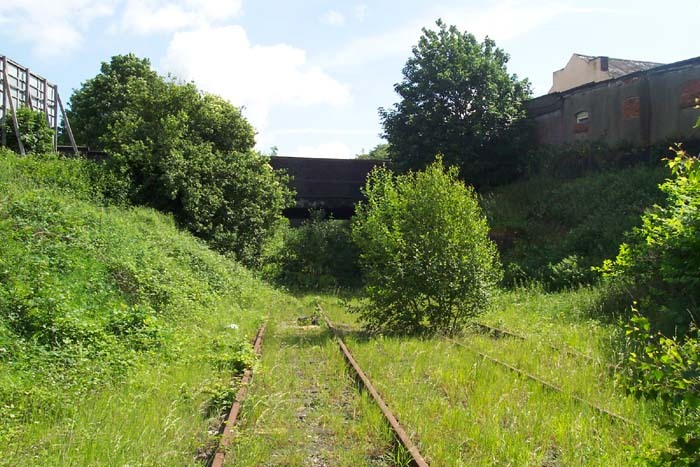 Above-left we have walked through the station and are standing at the point where the Darlaston branch would have begun to break away from the left-hand trackbed and to our rear. Ahead is Holyhead Road overbridge as we look towards Walsall. The terraced housing seen in the 1963 photograph appearing over the walling at this spot have been long-since demolished. Above-right we are in the mouth of Holyhead Road bridge looking back at the station site - the Darlaston branch would have curved-off to our right ahead of this spot. 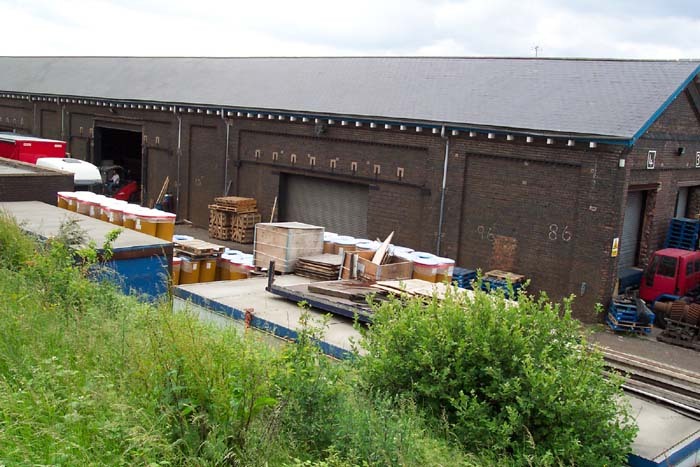 Above-left is what was once Wednesbury's LNWR goods shed served by the Darlaston line that passed it to the right as we look at it in this shot. 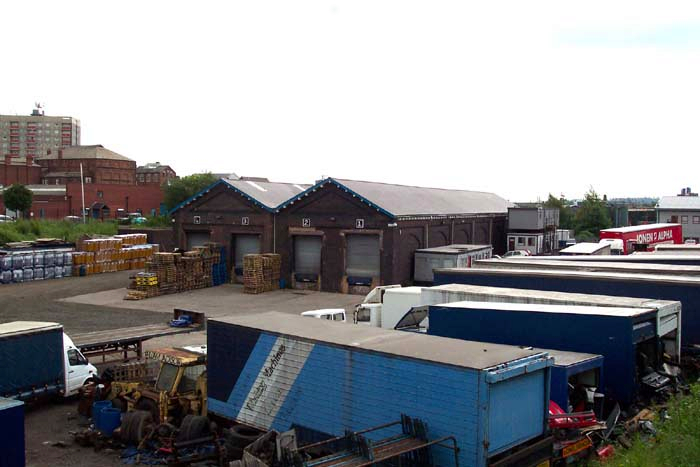 The facility is now known as Wednesbury Freight Terminal but is not rail connected. 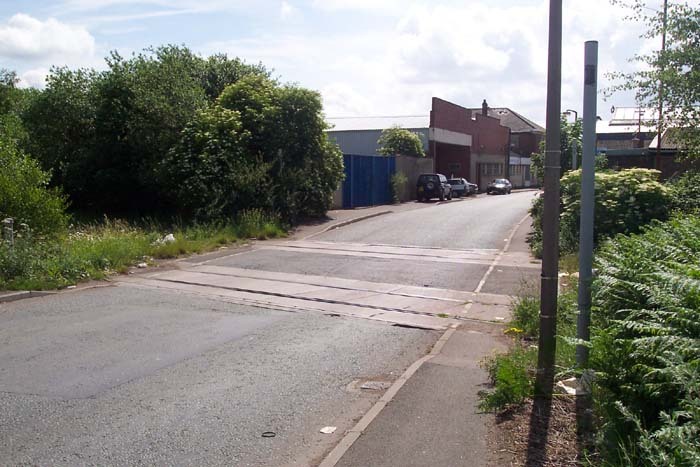 The site lies between Potters Lane and Stafford Street: the shot here taken from the corner of Potters Lane and Victoria Street, under which the Darlaston line ran. Above-right we have moved onto Stafford Street to get a closer look along the side of the shed that appears to be in excellent condition. This is a fascinating site to visit and I would certainly recommend it.